We molded the Topturn's value proposition behind the brand, the voice, the identity of the company as a whole. 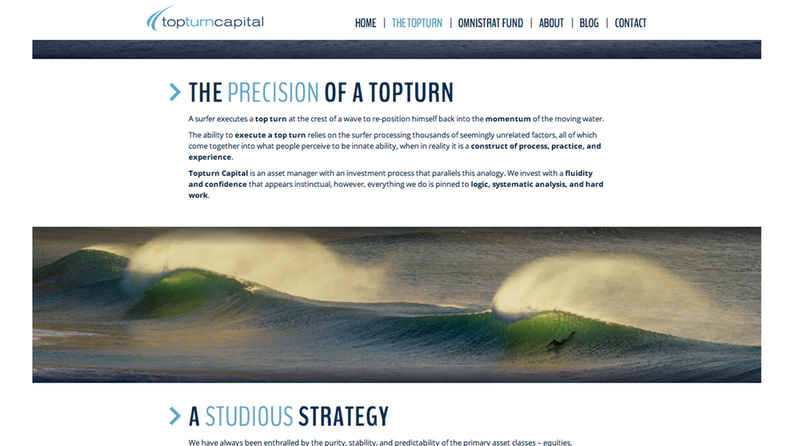 Their name isn't solely a 'top turn' in surfing, it is also reflective of their method and approach to investing. Topturn had recently undertaken a rebrand. 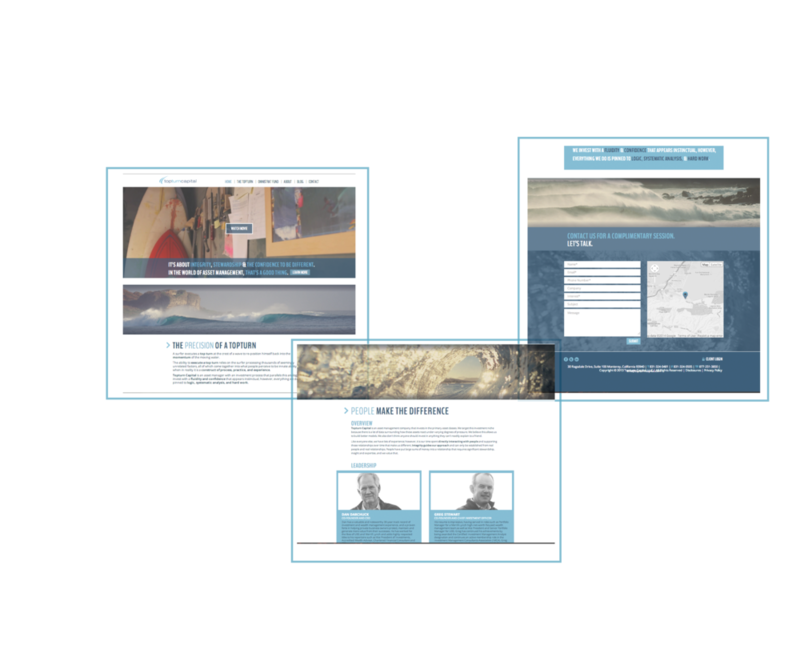 We helped to extend that rebrand beyond the name and logo by integrating video, a new website, tailored email marketing campaigns and public relations. Everyone says, "don't judge a book by its cover", but that's just not realistic. 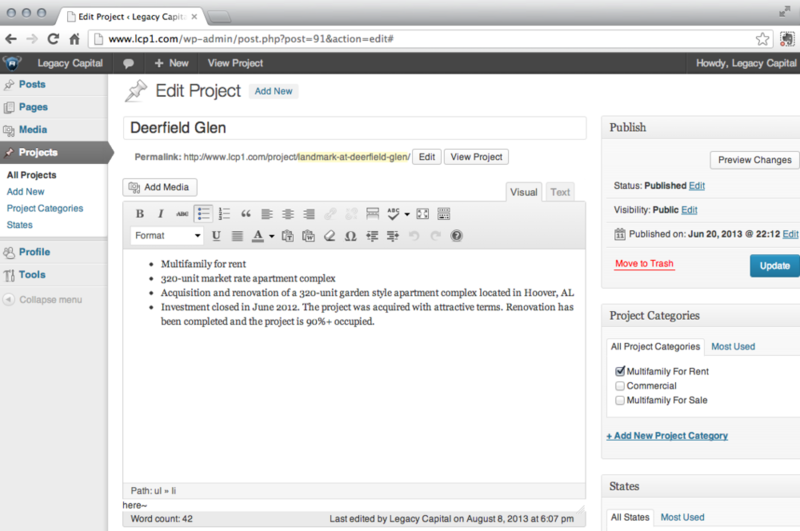 The website is one of the first things potential clients will look at to do their research. You want people to gain interest into your company, not lose it over a neglected website design. It only makes sense then, to display your sophistication and understanding of your trade in an aesthetic, design-forward format. We brought together Topturn's brand, story, strategic overview and custom imagery into a clean, responsive, Wordpress-based website. Email marketing offers a view into the relevance of your database, who is actually interested in what you have to say, and frankly, whether the content you're pushing out is working. We focused on clean, colorful and more image-heavy design, as well as minimal campaign primarily to generate traction to their blog. Nobody has the time to read a 30+ page marketing deck. They are supposed to get potential clients or investors excited and initiate conversations. Don't say the same thing everyone else seems to say and present information in a design-forward format with minimal, straightforward language. Topturn was a great example of a client that, at first, was a bit hesitant to go against the grain, be a little bit louder and stand out a part from the rest. We incorporated their bright blues, beautiful custom imagery, and crisp typography to the mix. But most importantly, we minimized the generic language, added some edge and only incorporated what was absolutely important. The end result? An enticing 10 page marketing deck. Oftentimes, many companies eschew the importance of marketing collateral - printed materials, leave-behinds etc. These pieces, if executed properly, can have a huge impact on how potential investors will remember your company, your brand, your conversations. We worked with Topturn to create an enticing leave-behind brochure, staying inline with the branding and using original artwork by uber-talented photographer Joe Curren. A lot of companies neglect to hire a PR firm writing it off as an easy way to spend money and not see any results. Topturn Capital is an enormous piece of evidence that when you stand out, hiring a PR firm is one of the most powerful moves you can make. Sure, Topturn Capital caught the first gust of wind heading out of the start gates with the ratification of the JOBS Act, but we also helped them tell their story with a professional public relations campaign, to help get their brand and efforts noticed. And boy, did they get noticed.